I would like to encourage you to make one more resolution. It does not require a whole lot of time or energy, but it does requires some courage and conviction. It is the resolution of becoming a little more active in the pro-life movement. And by that, I do not mean putting all of your time and energy into the pro-life cause, but rather becoming more involved in little things and situations. For example, if the topic of abortion comes up in conversation, do not be afraid to share your point of view and be ready to defend it. If you have friends who are not pro-life, and again the topic of abortion arises, gently explain to them the ugliness of abortion and why it should never be an option. Please, do not let any opportunity to show the truth of abortion pass you by. We need to make everyone aware of its reality. 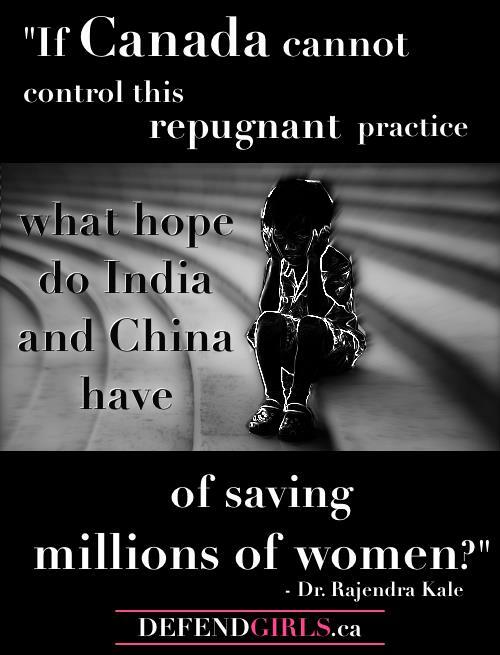 Abortion happens every day. Just in Canada, approximately THREE HUNDRED (300) babies are killed PER DAY. That is incredible, terrifying, and very sad. So please, lend your voice to the unborn and help us defend them. 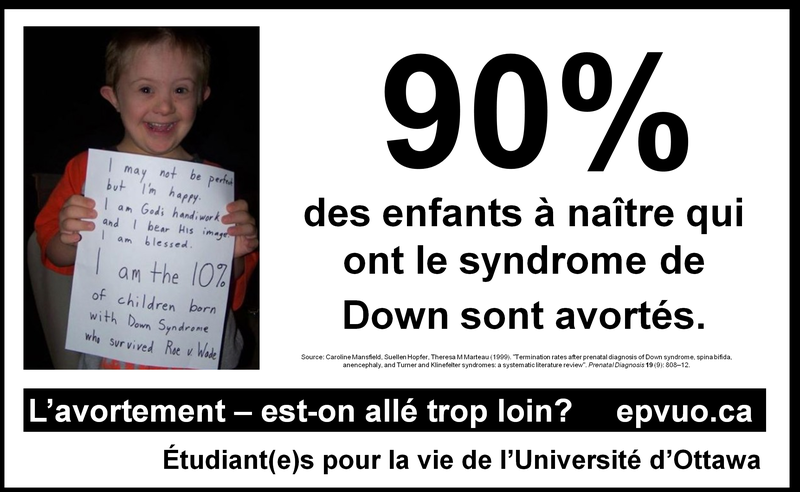 This entry was posted in abortion, advocacy and tagged abortion, by Nicole, New Year's resolution, public opinion, right to life on January 10, 2012 by uOttawa Students For Life. I recently went on a road trip to Saskatoon, crossing into the US at Sault-Ste-Marie, and passing through Michigan, Wisconsin, Minnesota, and North Dakota, before crossing into Manitoba and going on to Saskatchewan. In several of the places I passed through, in both the US and Canada, I saw something that surprised and delighted me. 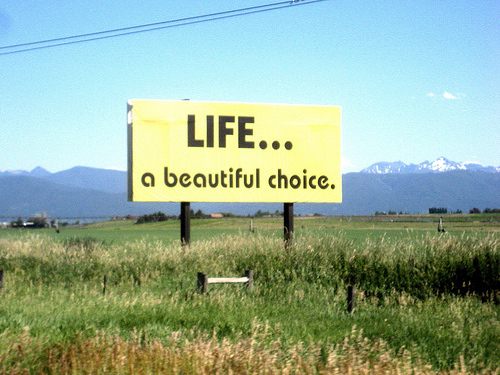 Periodically, at the side of the road and, in one instance, on a billboard, I saw pro-life signs. They said things like “An embryo is a baby too,” “Human life is a gift, protect it” and “Life…a beautiful choice.” The billboard sported a picture of an inquisitive looking baby with the words “I could dream before I was born.” One of the signs was outside of a church, but the others were just there, along the road, where one might usually see signs for tourist attractions, stores or hotels. No one had knocked them down or defaced them; they were just part of the landscape, and that was what struck me most about them. The aim of the pro-life movement is to work toward making abortion and euthanasia unthinkable. The opposition that students face in getting their pro-life views heard on campus, and the way the media gives scant and often skeptical coverage to pro-life events, could lead one to believe that the pro-life position occupies a miniscule place on the fringes of society. Yet, what is more mainstream than roadside signs? They advertise everything from burgers to candidates to atheism. Some may not be to our liking, and maybe some people feel upset when they see pro-life signs. Others must feel uplifted, as I did. Others still might just ignore the signs because they have seen them a hundred times. My point is not so much the response as the fact that the signs are there. They are part of everyday life and seem to indicate that the pro-life position is more a part of everyday life than we may have been led to believe. 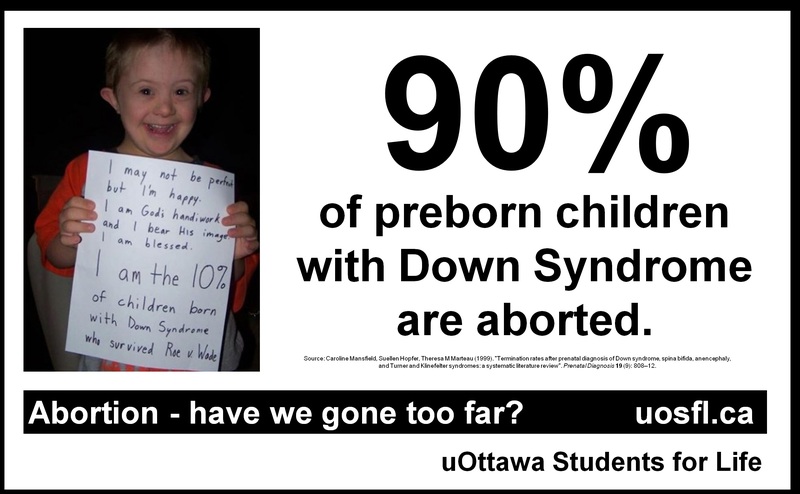 This entry was posted in abortion, advocacy, Uncategorized and tagged abortion, by Kate, Canada, culture of life, road trip, roadside signs, United States on October 13, 2011 by uOttawa Students For Life.